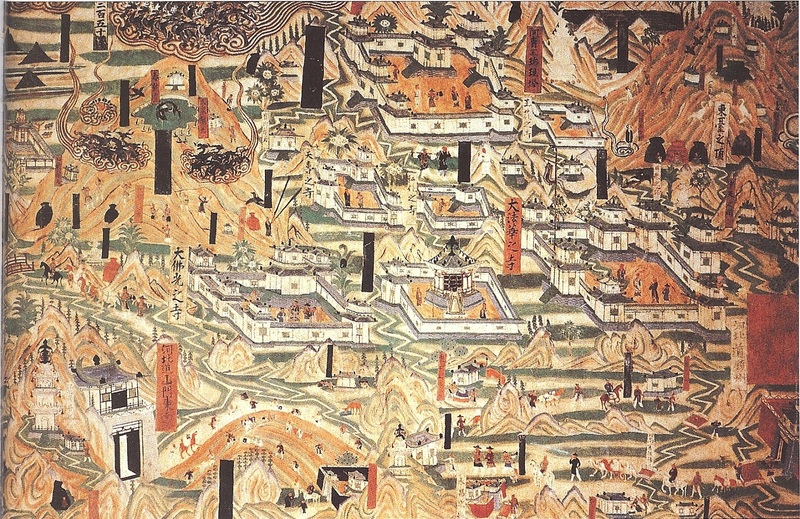 The Buddhist Art News website has very kindly re-posted my blog post from last week “Paul Pelliot at Dunhuang.” Buddhist Art News is a great, informative website that I go to regularly — and I did so long before they re-posted my writing! Place: At my computer, where else? Reading: Much to my surprise, I’m actually ahead of last year’s pace in completing books. That the ones I’ve read have mostly been short isn’t going to get in the way of my count. Inspired by the films I watched this week (see below), I’ve started Eddie Muller’s book Dark City: The Lost World of Film Noir. The exhibition catalog Out of Character: Decoding Chinese Calligraphy is still in progress. Watching: I have to confess to having watched Blazing Saddles again, for perhaps the tenth time – it still makes me laugh, and occasionally makes me cringe, after all these years! Otherwise my viewing was limited to a couple of Turner Classic Movies films on Friday night, both introduced by Eddie Muller (see above). The first film version of The Maltese Falcon, from 1931, was fair to good. The basic outlines of Dashiell Hammett’s story were there in much the same form as the much more famous 1941 film. Being pre-Code, this earlier rendition had a little more suggestiveness. But Ricardo Cortez, while having his own sort of charisma, isn’t quite Humphrey Bogart (a difficult standard to live up to, I know). Following that was City Streets, another early (also 1931) crime drama. 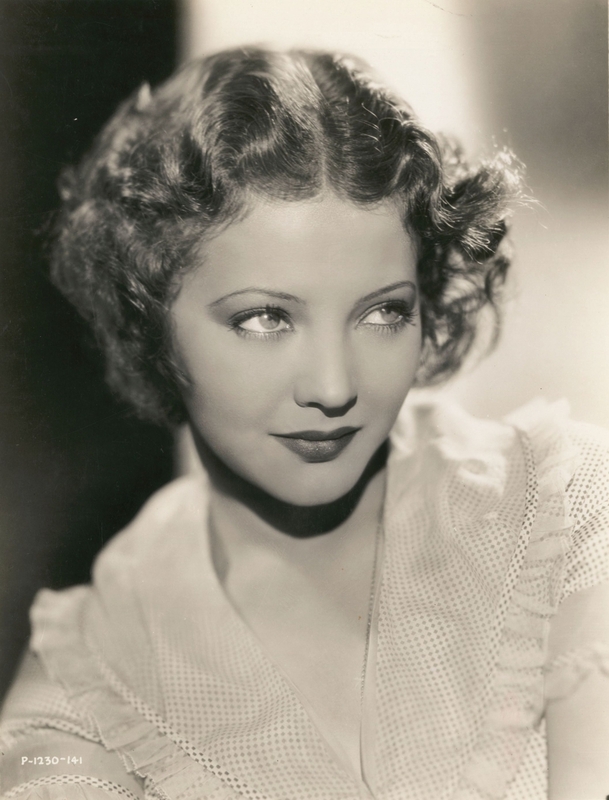 It was actually quite good, due to some creative directorial touches by Rouben Mamoulian, and the always-provocative presence of Sylvia Sidney. I may have to write something about her soon. As a dedicated WKRP in Cincinnati fan in years past, I knew of Sidney as one of the actresses that played the owner of the station and mom to station manager Arthur Carlson, the “Big Guy.” But at that point, thirty years ago, I had no idea that she was one of the most distinctive actresses of the 1930s. More to come. Listening: Once again, aside from a few short odds and ends, not much music in my life just now. That will change someday, I’m sure. 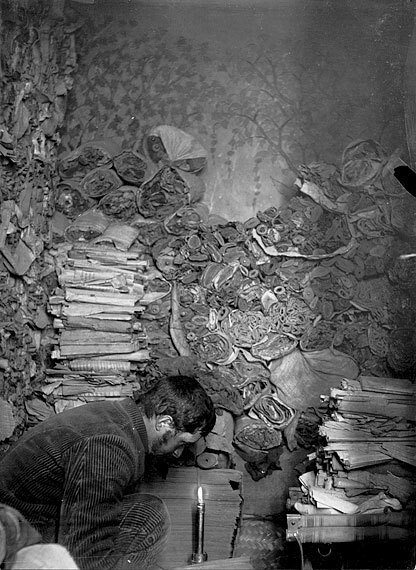 Blogging: A while back I had come across a photo of China expert Paul Pelliot examining manuscripts by candlelight in the so-called Library Cave at Dunhuang, the site of some of the most amazing paintings in the world. At first I was just going to post the photo without comment, but then decided to give some of its background. That was my major blog post for this week, along with a couple of photos of Dunhuang paintings (here and here). Promoting: My recommendation for the day goes to one of the best blogs I know of, Messy Nessy Chic, where you’ll find all sorts of fascinating and wonderful things. Their features “13 Things I Found on the Internet Today” and “Preserved Moments of Historical Sass” are the best! Hating: That Nelson Mandela is ill and back in the hospital. Appreciating: I would greatly appreciate some advice from you, gentle readers. As I look at the stuff I blog about, which can range from historical anecdotes to Buddhism to 1930s films to book reviews to paintings to modern classical music, I can’t help but wonder if I should break these disparate subjects up into different blogs, or at least different pages within the one blog? My interests are a little idiosyncratic, I admit – I usually write about whatever I happen to find interesting at any particular moment – and I fear that some folks who would be interested in, say, my historical vignettes, might not want to read about film noir or Buddhist symbolism or Giotto. In general, when you read blogs, do you prefer they stick to one subject or area of interest, or do you mind if they range far afield? Anticipating: San Francisco awaits in a few weeks, and along with the art exhibitions I mentioned last week, I might take in some of the San Francisco Ethnic Dance Festival. And I may even turn tourist for a while and wander around Chinatown (which might not seem that interesting, but in all the times I’ve been to San Francisco, I’ve only visited Chinatown once). Paul Pelliot studying manuscripts by candlelight in the Library Cave at the Mogao Caves near Dunhuang, China. Photo taken 1908. At first, I was going to post this photo by itself, with no commentary, simply because it’s so evocative – a lonely scholar sitting in a cave, examining mysterious piles of manuscripts by candlelight. But the story behind this photo is so interesting that I thought I would share some of it. 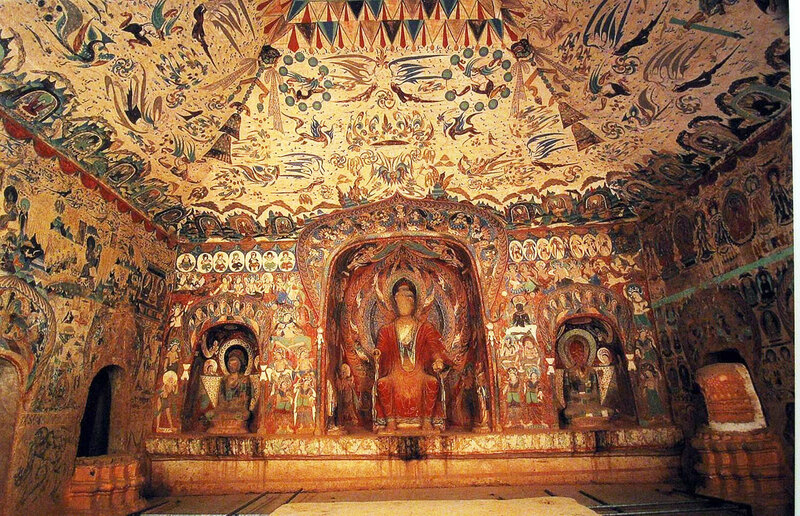 Dunhuang and its nearby Mogao Caves, the “Caves of a Thousand Buddhas,” comprise one of the world’s great artistic monuments. 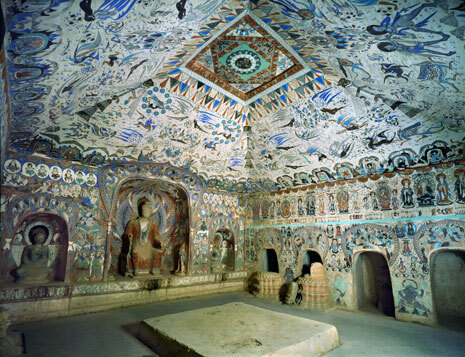 Named a UNESCO World Heritage Site in 1987, the Mogao Caves were occupied for around a thousand years, from the fourth to fourteenth centuries CE, and include hundreds of elaborately painted caves a nd shrines. They were abandoned and largely forgotten until the early twentieth century. Place: In the living room with my laptop computer, which after two hard drive failures and replacements in the last two months seems actually to be working. Eating: A piece of toast (yes, my life is full of excitement). Reading: While I haven’t yet implemented its suggestions, I finished reading Pema Chödrön’s new book How to Meditate, and found it very worthwhile. I’m still inching along in the exhibition catalog Out of Character: Decoding Chinese Calligraphy. It’s very interesting, but the parade of unfamiliar Chinese names and artistic figures makes for slow reading. Otherwise, though, I’m at that happy moment when I get to choose what to read next. The fateful choice may come later today. Watching: The only film I watched in the past week was Libeled Lady (1936), which happily turned up on Turner Classic Movies last night – a classic and wonderful film, with smart writing, a wittily convoluted plot, and that lively rhythm that makes screwball comedies so much fun. And how can one top a cast that features William Powell, Myrna Loy, Spencer Tracy, and Jean Harlow? One can’t! Listening: Absolutely none. For someone who has made his living in quasi-musical fields (orchestra managing, teaching, radio) for over thirty years now, I sure don’t listen to much music, or find that much pleasure in it when I do. At some point, though, one or more of my hundreds of CDs will call out to me, I’m sure. Making: I’ve made a mess of my living room – does that count? Blogging: I posted my essay on Buddhism’s Eight Auspicious Signs this week, which IMHO turned out fairly well. I’ve got a post on the China expert Paul Pelliot in the works, which should turn up in the next couple of days. Promoting: This very interesting post by David Kalat on the Movie Morlocks blog talks about how he goes about creating a DVD commentary track. I’ve heard a few of his commentaries; the guy knows his stuff. Hating: This story out of Tibet, an absolute outrage. Appreciating: A nice, quiet Sunday morning during which I can leave my front door open without hearing loud music or cars endlessly warming up. Wanting: I have no particular wants at this moment. What kind of bad consumer am I? How un-American of me! Anticipating: Still looking at a possible trip to San Francisco in a few weeks, to take in several art exhibitions (Japanese Art at the Asian Art Museum, 100 Years of the Spiritual in Modern Art at the Contemporary Jewish Museum/SFMOMA, Richard Diebenkorn at the de Young, and Impressionists on the Water at the Legion of Honor, among others). The thrills never stop, as I go to prepare another piece of toast.